Global vitamin E market expected to reach approximately USD 2.54 billion by 2024, at a CAGR of around 2% between 2018 and 2024. 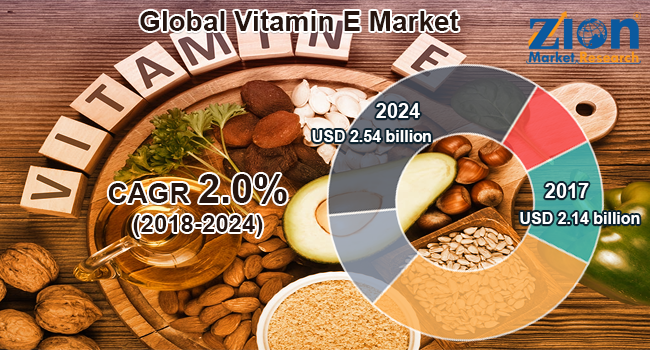 The increasing inclination for products that contain natural and healthy ingredients is likely to drive the global vitamin E market growth over the forecast time period. The report covers a forecast and an analysis of the vitamin E market on a global and regional level. The study provides historical data for 2015, 2016, and 2017 along with a forecast from 2018 to 2024 based on revenue (USD Billion). The study includes the drivers and restraints of the vitamin E market along with the impact they have on the demand over the forecast period. Additionally, the report includes the study of opportunities and threats to the vitamin E market on a global level. To understand the competitive landscape in the market, an analysis of Porter’s Five Forces model for the Vitamin E Market has also been included. The study encompasses a market attractiveness analysis, wherein the segments are benchmarked based on their market size, growth rate, and general attractiveness. The study provides a decisive view of the Vitamin E Market by segmenting the market based on product, application, and region. All the segments have been analyzed based on present and future trends and the market is estimated from 2018 to 2024. By product, the market is segmented into synthetic vitamin E and natural vitamin E. Natural vitamin E is further divided into tocopherol and tocotrienols. By application, the market is segmented into cosmetics, human nutrition/dietary supplements, animal nutrition, and functional food and beverages. The regional segmentation includes the current and forecast demand for North America, Europe, Asia Pacific, Latin America, and the Middle East and Africa. Some key players of the global vitamin E market are Riken Vitamin Co. Ltd., Zhejiang Worldbestve Biotechnology Co., Ltd., Wilmar Spring Fruit Nutrition Products Co. Ltd., Archer Daniels Midlands Company, BASF SE, DSM N.V., Beijing Gingko Group, Davos Life Science, FenchemBiotek, and Eisai Food and Chemical, among others.